More than 80 million American adults are chronically sleep deprived. I was one of them, until recently. Here's the ways I've improved my sleep. Do you remember when you used to enjoy sleeping? Or better yet, do you remember the last night you had a good night’s sleep? It’s probably been a while, if you’re the average American. Today, the average American sleeps less than seven hours a night, about two hours less than a century ago. According to the U.S. Centers for Disease Control and Prevention, more than 80 million American adults are chronically sleep deprived, meaning they sleep less than the recommended minimum of seven hours a night. In high school, I set myself a strict schedule. I’d wake up at 5 a.m., hit the gym for an hour and then be on my way to school. Because I didn’t want to be exhausted the next day, I’d go to bed no later than 10 p.m. every night. Then, college (freedom) rolled around, and I started staying up all night to go out on weeknights and pull all-nighters for exams I didn’t study for until last minute. College set the stage for my bad sleeping habits, and I still haven’t shaken them, thanks to the always-on work culture so many of us live in today. I didn’t take my lack of sleep very seriously until recently. As so many professionals do, I wore my lack of sleep as a badge of honor, which as it turns out, is anything but something to be proud of. In fact, after researching this post and getting serious about my health, staying up into the wee hours of the morning is something I just won’t do anymore. Don’t get me wrong. I still struggle sometimes, but for the most part, I’m doing much better than I was a few months ago. In this post, you’ll learn all my new sleep habits, tips and tricks to help you get to bed earlier and take charge of your life. But first, let’s dissect the importance of sleep. If you’re already sure you know the pros, feel free to skip ahead to the next section. A lack of sleep, defined as six hours or fewer, can have deadly consequences. Driving while tired is as unsafe as drunk driving and texting and driving. Studies show that going without sleep for 20 to 21 hours and then getting behind the wheel is comparable to having a blood alcohol level of about .08 percent, the legal limit in most states. If you’re awake for 24 hours and then try to drive, you’re at a blood alcohol equivalent of 0.1 percent, which is higher than the legal limit in all states. You risk drowsy driving when you get less than six hours of sleep and if you snore at night, because snoring is a symptom of sleep apnea and interrupted sleep. In 2009, an estimated 730 deadly motor vehicle accidents involved a driver who was either sleepy or dozing off, and an additional 30,000 crashes that were nonfatal involved a drowsy driver. Accidents involving sleepy drivers are more likely to be deadly or cause injuries, in part because people who fall asleep at the wheel either fail to hit their brakes or veer off the road before crashing. Sleep dramatically affects our mental health as well. Anyone who consistently sleeps less than six hours a night has an elevated risk of depression, psychosis and stroke. The first segment of the brain that begins to fizzle when we don’t get enough sleep is the prefrontal cortex, the cradle of decision-making and problem-solving. Underslept people are more irritable, moody and irrational. “Every cognitive function to some extent seems to be affected by sleep loss,” says Chiara Cirelli, a neuroscientist at the Wisconsin Institute for Sleep and Consciousness. Sleep-deprived suspects held by the police, it’s been shown, will confess to anything in exchange for rest. Lack of sleep is also directly tied to obesity. Without enough sleep, the stomach and other organs overproduce ghrelin, the hunger hormone, causing us to eat more than we need. According to researchers, adults who sleep less than five or six hours a night are at higher risk of being overweight, and among children, sleeping less than 10 hours a night is associated with weight gain. Even losing just a few hours of sleep a few nights a week can lead to almost immediate weight gain. Part of the reason may be that sleep-deprived people eat more. Staying up late and skimping on sleep leads to more eating in general and a hankering for carbohydrates. In one study, sleep-deprived eaters ended up eating more calories during after-dinner snacking than in any other meal during the day. By the end of the first week the sleep-deprived subjects had gained an average of about two pounds. Overall, people consumed six percent more calories when they got too little sleep. Once they started sleeping more, they began eating more healthfully, consuming fewer carbohydrates and fats. 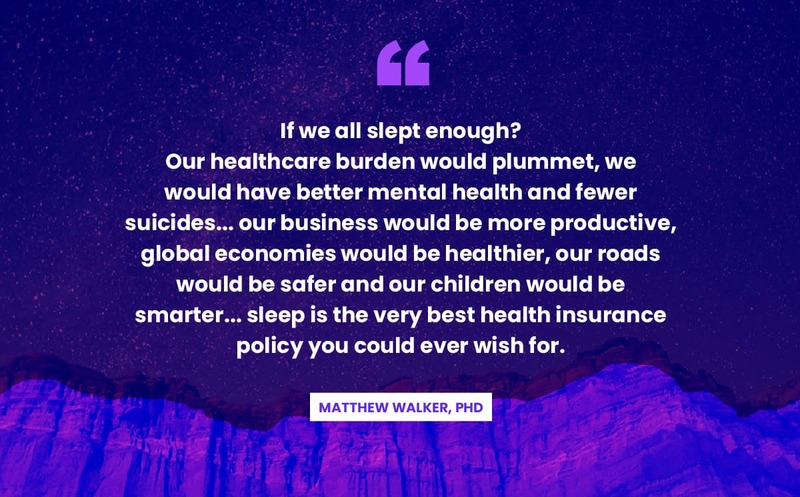 If that wasn’t bad enough, sleep deficiency kills our productivity and the immune system and may even shorten our life span. We need sleep to improve our brain function. A tired brain is not a wise brain, and people who are sleep deprived make more mistakes. The American Insomnia Survey, published in 2012, estimated that 274,000 workplace accidents were directly related to sleep problems. The bill for these sleep-deprived mistakes? $31 billion annually. Furthermore, some research suggests that when you don’t sleep (like when students pull an all-nighter), your ability to learn new information drops by almost half. 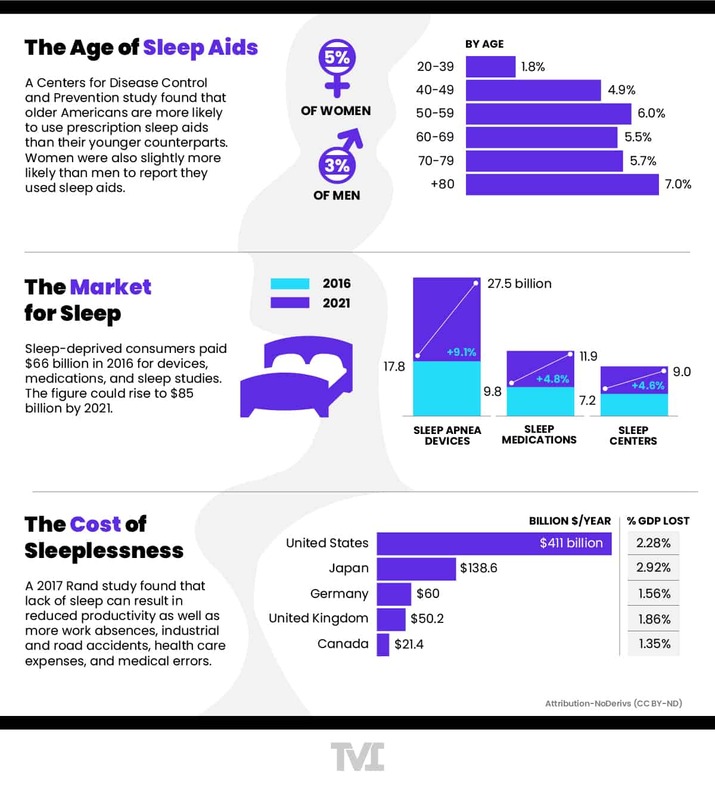 The sleep market continues to grow and the consequences of sleeplessness are staggering. Sleep-deprived consumers paid $66 billion in 2016 for devices, medications and sleep studies. The figure could rise to $85 billion by 2021. Because I’ve been obsessed with sleep for a while, I’ve tried a lot of these products. Here’s what I’ve found to be the most effective at putting (and keeping) me to sleep. 1. Get out of bed if you can’t sleep. 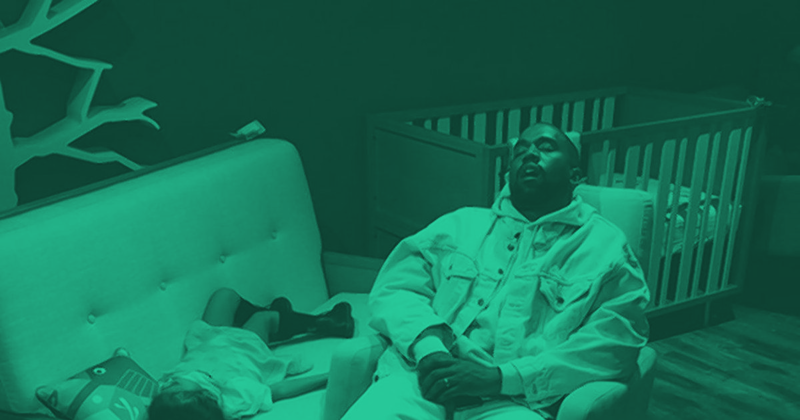 If you’re like me, it can take significantly longer to fall asleep than 20 or 30 minutes, which is the amount of time it should take to fall asleep. If it takes you longer to fall asleep than half an hour, you should consider getting out of bed and going into another room. If you don’t, your brain will start to associate your bed with being awake. This is why your bed should be restricted to sleeping. So instead of staying in bed, go to a dim room in your place, and read an actual paper book or magazine. Don’t open your phone or computer. You don’t want any blue light messing with your sleep. Only return to bed when you feel tired enough to sleep. According to the National Sleep Foundation, the best sleep happens in a room that’s around 60 to 67 degrees F for adults and children, and between 65 and 70 degrees F for babies and toddlers. Throughout the day, your body temperature bounces up and down. As you inch nearer to sleep, your temperature begins to drop, getting your body ready for REM sleep. If your room is too warm, it prevents your body from reaching its optimal sleep temperature, setting the stage for a restless night sleep and possibly insomnia. Waking up sweaty is a surefire symptom that your room is too warm, or you’re using too many blankets. But be careful, you don’t want to make it so cold that your muscles contract to stay warm. This will prevent you from relaxing and falling into a deep sleep. If you’re worried about your electricity bill, get a fan, which can make a room feel up to 10 degrees cooler. After learning this, last night, I put my air on 67 degrees (only two degrees cooler than I usually keep it), but I still woke up hot. While I’m considering splurging on a cooling mattress, I plan on trying cheaper cooling solutions in the meantime, to see if they help at all, before making a major purchase. Let me know in the comments what cooling sleep products you’ve tried that worked or didn’t. Super interested in this topic! 3. Drink Sleepytime Tea before bed. 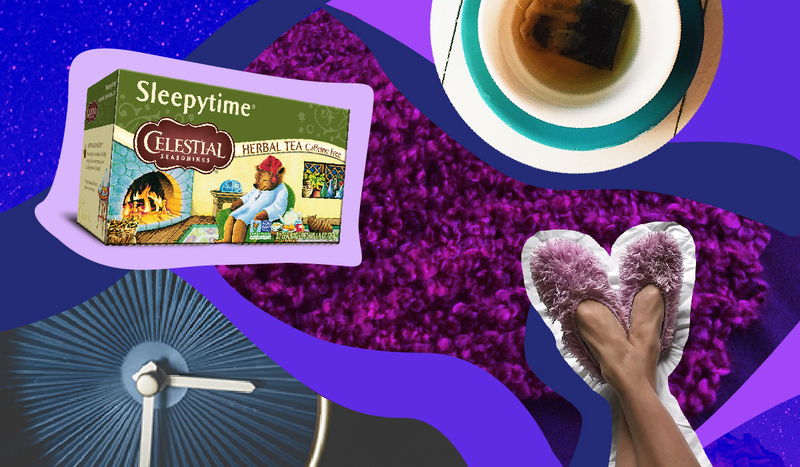 I’m terrible about making tea at night, because I’m not really a hot tea drinker, but when I do drink my Sleepytime Tea (I get the Sleepytime Extra), I’m able to fall asleep pretty quickly. It definitely makes you tired. What are the ingredients you ask? 4. Listen to music that induces sleep. Sleep apps that play “special music” to induce sleep are a dime a dozen, which can make choosing one difficult. I’ve been a Brain.fm annual subscriber ($47.40 for 1 year) for the last two years, and I will renew again when the time rolls around. You can read about the specifics about how they develop their music in this white paper. It’s all scientifically proven, based on experiments they run. Side-note: You can use Brain.fm to help you meditate, focus and/or relax, in addition to sleep. Forty percent of American adults say they have difficulty falling asleep at least a few times each month. The most common reason is an inability to stop thinking. Having too much on my mind is one of the biggest reasons I’ve always found it hard to fall asleep. My panacea? Brain dump. Get everything out of my head, so I don’t have to hold onto it anymore. As it turns out, writing doesn’t just help me sleep. It helps a lot of restless people (who aren’t even writers) fall asleep. There are two ways to write that should help you fall asleep. The first is writing a to-do list. The second is to work through your worries in a journal, whenever you can’t sleep. Create a to-do list before bed. Scientists have found that writing to-do lists helped people fall asleep an average of nine minutes faster than writing about completed tasks. Participants were randomly asked to write about tasks that they had either completed or needed to complete in the near future. The former group fell asleep in 25 minutes versus 16 minutes for the latter. They also found that the people who wrote longer, more detailed to-do lists fell asleep faster than those who wrote shorter, more vague ones. Journal when you can’t sleep. According to research (and my experience), journaling helps you in a multitude of ways, including helping you get a good night’s sleep. You don’t even have to commit to writing every night. Just do it when you can’t sleep (but make sure you get out of bed to do it). While you can (and should) write about whatever you’re thinking about in the moment, blank pages can be scary and unmotivating, so here are a few prompts to jumpstart the process. If you’re looking for more of a daily writing routine, you may want to check out “The Artist’s Way” by Julia Cameron. 6. Get an oil diffuser with lavender scented oils. There are plenty of studies that report essential oils, specifically lavender-scented oils, help combat insomnia and increase slow-wave sleep, which is instrumental for slowing heartbeat and relaxing muscles. I know these findings are accurate, because I have an oil diffuser in my room to help me sleep at night. Here’s a list of the best oil diffusers, according to Wirecutter. And here’s a search I did for “lavender essential oils” on Amazon. Out the door, it should cost you less than $50. In the past month, nearly 10 million people in America will have swallowed some kind of a sleeping aid. To put this in perspective, the original Star Wars movies—some of the highest-grossing films of all time—required more than 40 years to amass $3 billion in revenue. It took Ambien just 24 months to amass $4 billion in sales profit, discounting the black market. It’s not surprising, considering these pills will knock you out faster than not taking anything, but the problem is they don’t induce “natural sleep,” which means you aren’t getting any quality sleep. These symptoms instigate a vicious cycle of insomnia and addiction. The irony is that these pills only slightly increase sleep and the benefit is more subjective than objective. But here’s a way scarier finding: Individuals using prescription sleep medications are significantly more likely to die than those who do not. Even occasional users—those taking 18 pills per year—aren’t safe. They were still 3.6 times more likely to die at some point across the assessment window than non-users. Those using sleep meds, like Ambien, were more likely to develop cancer as well. I bet when you think of hypnosis, you think of some weirdo swinging a pocket watch in front of your eyes until you fall asleep and let the weirdo take over your brain. Honestly, before I tried hypnosis, I imagined sort-of the same thing. In real life, this is far from how hypnosis works. In my experience, the entire time of each session was simply spent engaging in a deep guided conversation that really makes you think. It’s almost like therapy, with real, tangible results. As it turns out, I’m quite responsive to hypnosis. I went to three, 2-hour hypnosis sessions in a period of about a month, and now, I’m a huge hypnosis advocate, because it works, and it supposedly will work for years and years to come. When I first began my search, I was really anxious about choosing the best hypnotist, especially because all the websites I landed on looked like they were straight out of the ‘90s. So how did I decide who to go to? First, I searched Google for “hypnosis near me,” and filtered Google Business listings down to the nearest person who also had the MOST GOOD DETAILED reviews on Google. Then, I poked around their websites. If I liked what I read or watched, I completed the contact form to get more information. I wanted to see how long it would take to get a response, and what they said when they responded. I went with Guillermo because he was the only one who responded straight away with a detailed message that explained everything and told me how much it would be up-front. I’m not sure if he does Skype sessions, but I highly recommend him, if he does. Otherwise, follow my process to qualify a good hypnotist near you. Expect to pay what you would for a therapy session—somewhere between $100-$200/session. How many sessions you need varies among individuals, but it’s usually less than seven. If you can’t afford hypnotherapy yet, try a sleep hypnosis app or pre-recorded sessions, which you can usually find in a products section on hypnotists’ websites. Tracking your sleep is a surefire way to keep yourself honest about how much—or how little—sleep you’re getting. Here are a few sleep tracker recommendations, depending on your specific technology. 10. Take Melatonin before bed. 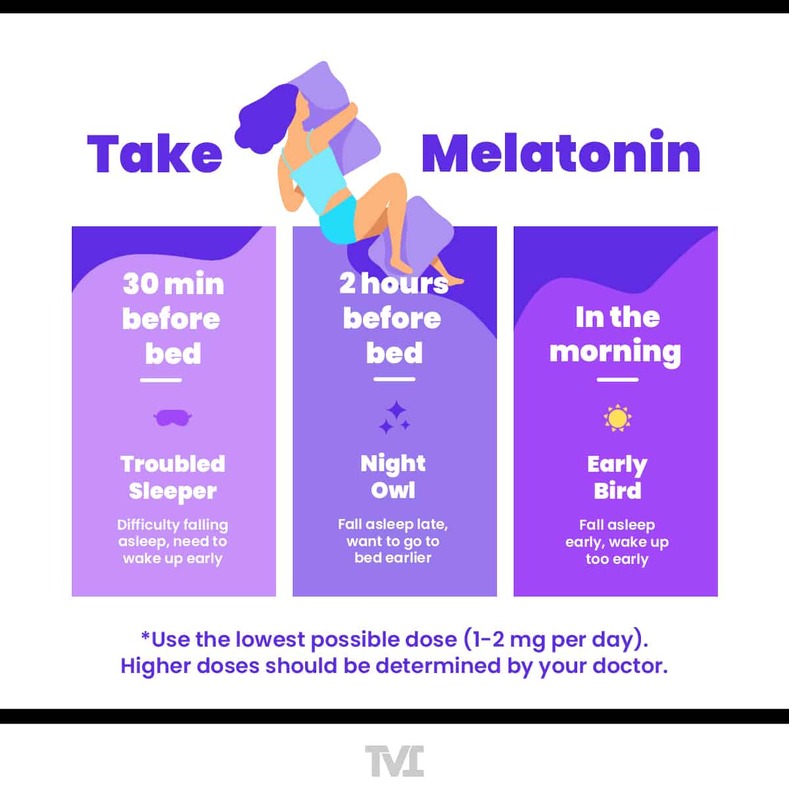 Here’s a good guide on Melatonin, and/or you could visit your local GNC or Vitamin Shoppe, and ask a customer service rep for more information. As I’ve pointed out throughout this article, sleep is vital to a healthy, happy and successful life. While I admit it can be difficult to get a full eight hours of sleep, I’ve realized the consequences of any less just aren’t worth it to me. I hope I’ve convinced you of the same. Please include attribution to The Vector Impact with this graphic. Did I miss any sleep hacks that work for you? Please do share them in the comments. Originally published on Dec. 6, 2018 on The Vector Impact. Lauren Holliday writes for The Vector Impact, The New and The Next and many others.